What would you do if characters from your favorite books began appearing in the real world? When Travis Williams learns that his local library is closing—forever!—he immediately pitches in to help save it. But he has no idea that this decision will change everything. Characters from John Steinbeck's novels, perhaps even the ghost of the famous writer himself, suddenly begin to appear all over town, beckoning Travis to follow them into the dark and dangerous Corral de Tierra. What do these phantoms want from Travis? There's only one way to find out. 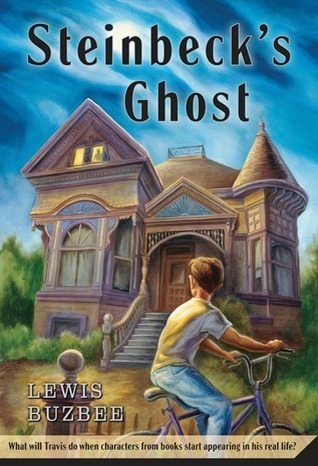 "Magical realism with Steinbeck's ghost and a discerning young hero." "The story is an intruiging introdutcion/companion to Steinbeck's work and imaginatively conveys the power of literature to transport people to another time and place." "The themes of valuing friendship, managing adults who have lost their priorities, and connecting people through stories will appeal to kids who have found their own magic in the library." "Buzbee's love for literature and libraries is infectious and, for those similarly inclined, deeply satisfying." Finally. He finally found the word he had been looking for. The moment Travis Williams stepped out of his house into the warm September afternoon, the word came to him. For months, ever since he and his parents had moved into the new house, he’d been trying to figure out what was so creepy about this place. Now he knew. He stepped off the porch into the bright sunshine and whispered the word. A Wrinkle in Time was one of Travis’s favorite books. He’d first borrowed it from the library a couple of years ago, when he was eleven, and had probably borrowed it three times since, read it he didn’t know how many times. Whenever he thought of the book, he pictured the planet Camazotz. On Camazotz, everything was perfect. Every house was exactly like every other house, every lawn like all the rest. Every garden grew the same kind of flower, and the exact same number of those flowers. Everyone in Camazotz dressed like everyone else, and they all did the same things and at the same times. One child played ball in front of each house, and each ball bounced to the same beat. Camazotz was supposed to be a perfect planet. And in a way, Travis thought, it was perfect. Perfectly creepy.